AVALON is excited to welcome back another great - the one and only EDX on Saturday December 15th. Maurizio Colella, professionally known as EDX, is a world renowned, chart-topping Italian producer/DJ that will be gracing our stage with his deep and melodic beats. He’s no rookie - having worked with high profile artists like Axwell, Deadmau5, Bob Sinclair, Armin Van Buuren, Steve Angello, and many more. It is not unusual that most of his singles and remixes hit the Top 10 on Beatport, DMC Buzz, and Cool Cuts. EDX hosts a weekly podcast show, “No Xcuses” on his Soundcloud page where he curates some of the best music out there. It is no surprise that dance music bible Mixmag hailed him as a “GENIUS”. 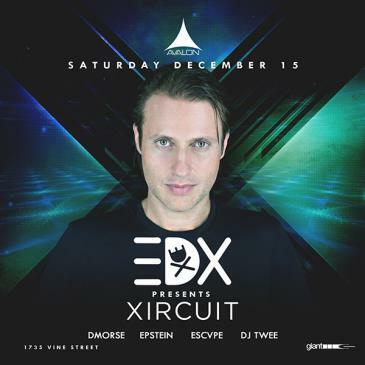 EDX will be serving up soothing beats of house music on 12/15 alongside the support of DMORSE, EPSTEIN, ESCVPE, and DJ TWEE.